TimeZone : Industry News » Baselworld 2019 - Zenith Defy Inventor with 129,600 VPH! With its new disruptive "Zenith Oscillator" control system, the brand with the guiding star is revolutionising mechanical watchmaking. High frequency, chronometric precision, reliability and stability: the oscillator developed and patented by the Manufacture replaces the traditional sprung balance used for more than three centuries! Featuring a single element (compared with 30 or so components of a standard regulating organ), this high-tech device equips the new DEFY Inventor. 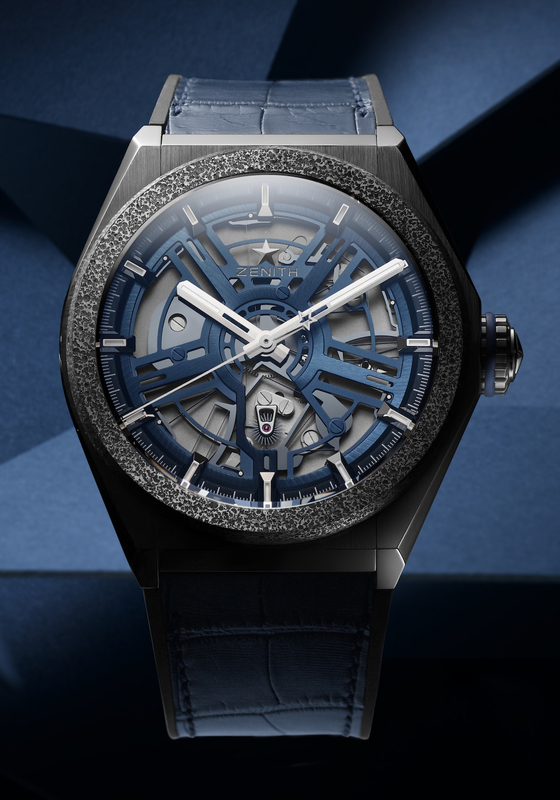 A case made of lightweight titanium and Aeronith an innovative aluminium-polymer composite teamed with an architectural design: through the DEFY Inventor, Zenith is (re)inventing the watchmaking of tomorrow, in an entirely independent manner. Zenith announced right from the start that DEFY would write new chapters in its history. This contemporary, even futuristic saga given that the brand's visionary gaze remains firmly fixed on the horizon began in 2017 with the remarkable 100th of a second chronograph named DEFY El Primero 21. The same year, Zenith unveiled DEFY Lab, an 'archetype' regulated by a revolutionary oscillator developed by the Manufacture and issued in a 10-piece limited edition. Today, the 'specimen' is moving beyond laboratory stage and becoming the DEFY Inventor, produced in a run of several hundred units and equipped with its own patented regulating organ. Like its predecessor, DEFY Inventor offers superlative technical performance and a modern aesthetic composed of cutting-edge materials. With its chronometric precision, this avant-garde three-hand watch is now series-produced an industrial tour de force and stylised to appeal to urban aesthetes. A brief reminder of its outstanding assets. Beating at the extremely high frequency of 18 Hz (compared to the usual 4 Hz usually) and endowed with a comfortable two-day autonomy, Defy Inventor owes its exceptional properties to a disruptive technology: the single-piece Zenith Oscillator developed and patented by the Maison. A strategic component that constitutes the ultimate achievement of an independent Manufacture capable of developing and producing a mechanical movement in its entirety, including its own regulating system! The result of an unprecedented scientific approach to the quest for performance, it has replaced the sprung balance used in mechanical watchmaking for three and a half centuries. This major innovation for the industry offers a number of benefits. Firstly, increased reliability, given that this unique ultra-thin element (0.5 mm) replaces the thirty or so components of a standard regulating organ and thus eliminates contact, friction, wear and deformation; and secondly, stability, since it is made of monocrystalline silicon and therefore insensitive to temperature variations and magnetic fields. In addition, its escape-wheel is made of flexible blades, a first in the watch industry. These exceptional qualities are triple certified: for magnetic insensitivity (ISO-764), thermal insensitivity (ISO-3159) and chronometric precision (TIMELAB Foundation of the Geneva Laboratory of Horology and Micro-engineering). So much for the technical aspects, as we now turn to the design. An innovative 'engine' has been teamed with an avant-garde exterior. DEFY Inventor is as architectural as it is organic. Like an animated being in a state of perpetual motion, its heart of a new genre pulsates on the dial side, beneath a sophisticated openworked construction. Its powerful stature is carved out from ultra-light materials: brushed titanium for the 44 mm diameter case, Aeronith for the textured bezel. This lightest aluminium composite in the world was developed using an exclusive high-tech process. Three times lighter than titanium, made of open-pore aluminium foam, stiffened with a polymer, Aeronith is easily forgotten when worn, while asserting a unique modern style. The equally airy openworked dial forms a stylised propeller, of which the five 'blades/branches' evoke the Zenith star. Broad hours and minutes hands sweep over the mechanism, while a slender star-tipped central sweep-seconds hand equipped with a stop-seconds system enabling ultra-accurate adjustment marks off the seconds. 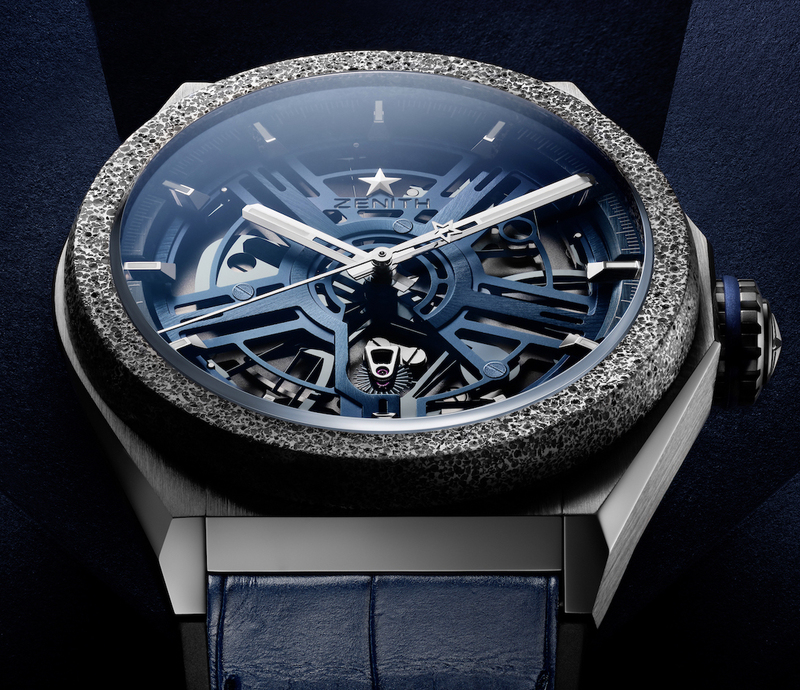 In an ultimate touch of futuristic sophistication, the iconic DEFY Inventor is secured to the wrist by a black rubber strap with a midnight blue alligator coating. The case, in titanium with an Aeronith ((the lightest aluminium composite in the world) bezel, measures 44mm x 14.5mm. It has an AR-coated sapphire crystal, a sapphire display back, and it is water resistant to 50 meters. Movement is the Swiss automatic Zenith in-house caliber 9100 wotj 18 jewels, 129,600 vph (18 Hz) and a power reserve of 50 hours. Rotor with Côtes de Genève decoration. Functions are: hours, minutes and central seconds. Monolithic regulating organ made of Silicon (no need for lubrification) Triple certification: Insensitivity to magnetism (ISO-764), Insensitivity to temperature gradients (ISO-3159) and Chronometer certified by TimeLab. It has a blue openworked dial with Rhodium-plated faceted hour markers with SuperLuminova and Rhodium-plated,faceted SuperLuminova hands. It comes on a black rubber strap with blue alligator leather coating and a titanium double folding clasp.